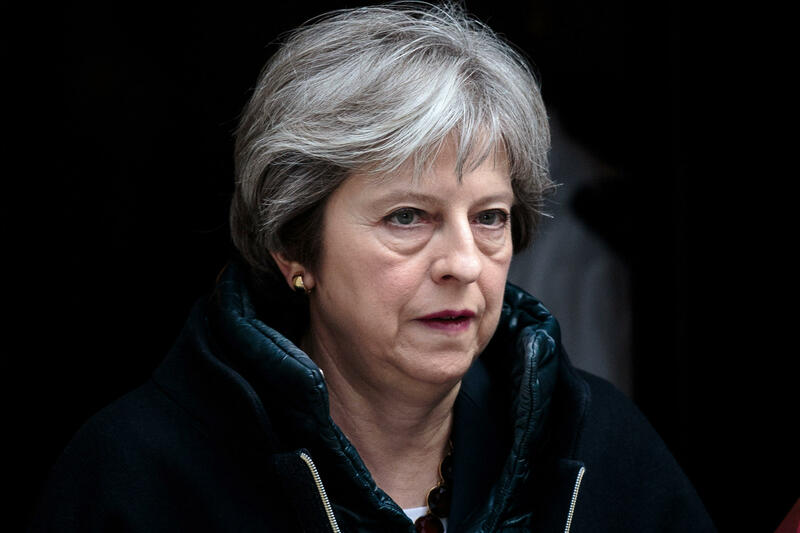 LONDON -- British Prime Minister Theresa May announced punitive measures against Russia on Wednesday over the chemical weapon attack on Russian former double agent Sergei Skripal and his daughter in the English city of Salisbury. Speaking on the floor of the British Parliament, May said Russia had provided "no credible explanation" as to how the powerful Novichok chemical nerve agent came to be used in Britain, saying, "instead they have treated the use of a military grade chemical agent in Europe with sarcasm, contempt and defiance." She said it was part of a "well established pattern" of Russian actions and that she and her cabinet had concluded there was no possible explanation other than that Moscow was "culpable for the attempted murder of Mr. Skripal and his daughter." In response, May's government decided on "immediate actions to dismantle Russian espionage operations in the U.K.," including formally expelling 23 Russian diplomats in Britain who had been identified as "undeclared" intelligence agents. The diplomats were given one week to leave the United Kingdom. May vowed that new laws would be sought to try and prevent future attacks by foreign agents in Britain, and that authorities would push for the full use of existing powers to track people travelling to Britain from abroad suspected of nefarious intent. Before her remarks to lawmakers in Parliament, May chaired a meeting of the national security council to consider various sanctions after Moscow ignored a deadline to explain how poison -- developed by Moscow decades ago -- ended up being used to target the former spy on English soil. May said Britain would not cut all diplomatic contact with Russia, but it would curtail "all planned high level bilateral contacts," including revoking an invite to Russia's top diplomat Sergey Lavrov. In addition, she said no members of the royal family or the cabinet would attend the soccer World Cup this summer in Russia. May had weighed a range of economic and diplomatic measures against Russia in response to the assault, which has left Skripal, 66, and his 33-year-old daughter Yulia in critical condition in a Salisbury hospital. The first police officer to attend to the pair where they were found on a public bench on March 4, in an incoherent state, also remains hospitalized in a serious but stable condition. Russia's foreign minister has dismissed Britain's accusations that Moscow was involved in the nerve agent attack -- either by failing to control its chemical weapons stockpiles or through direct involvement in the attempted murder. Foreign Minister Sergey Lavrov has said Russia had no motive to poison Skripal -- but "those who want to press their Russophobic campaign in all spheres of life could have it." Lavrov compared London to a prosecutor who oversaw Soviet dictator Josef Stalin's purges and who said confession is enough for conviction. Lavrov said London went a step further, expecting the world to rely on its suspicions to blame Russia. But pressure is mounting on Moscow. President Trump voiced his support for Britain, telling reporters outside the White House on Tuesday that "it sounds to me that it would be Russia based on all the evidence they have." "As soon as we get the facts straight, if we agree with them, we will condemn Russia or whoever it may be," Mr. Trump added. Before May's remarks to Parliament, the British Foreign Office said the U.K. delegation to the United Nations had requested an urgent meeting of the Security Council, "to update Council members on the investigation" into the nerve agent attack. May said Britain would seek a "robust" response from the Security Council to the attack, and would seek a full verification of the evidence in the incident from the Organization for the Prohibition of Chemical Weapons (OPCW). CBS News' Pamela Falk reports from the U.N. that the Security Council convened an urgent meeting on the issue Wednesday afternoon. "The credibility of this Council is at stake if we don't hold Russia accountable," U.S. Ambassador Nikki Haley said. U.N. Secretary-General Antonio Guterres said he is "deeply concerned over the reported use of a nerve agent in the United Kingdom to harm or kill persons." "The use of nerve agents as a weapon, under any circumstances, is unacceptable and its use by a state would constitute a serious violation of international law," the Secretary-General said, qualifying the statement to note that he is not in a position to attribute responsibility. The Kremlin rejected May's deadline, which expired at midnight Tuesday evening, to explain the poisoning. Dmitry Peskov, spokesman for President Vladimir Putin, told reporters on Wednesday that Russia "rejects the language of ultimatums." Peskov said Britain had so far only offered "baseless accusations which are not backed up by any evidence" and said Russia would cooperate with the investigation but did not consider Britain willing to reciprocate.